per order on retail purchase. to lower 48 states. Shipping may be less depending on weight of shipment. Please be patient with me while I learn how to change my website for viewing on small devices. A blend of soft amber and musk. A bit of frankincense, myrrh and patchouli are added to make this fragrance a heavenly mélange. Webster's definition of Ambrosia: something extremely pleasing to taste or smell. This fragrance is the delightful aroma of spices and pear. Divine! The aroma of apples with the woodsy fragrance of sweet burning oak. A yummy smell to warm your home and your heart. A pine and evergreen scent straight from the mountains. Fresh from the oven, the name says it all. The fragrance of delicious, sweet, rich, ripe black cherries. The tempting aroma of fresh baked sugar cookies, rich with butter and vanilla. There's no better way to make yours a truly warm, inviting home. Cinnamon and Canella are from the same species and thus similar in aroma, but canella, often called “white cinnamon”, is much more aromatic. This fragrance is a blend of canella bark, cinnamon stick and crushed nutmeg. Wonderfully warm and spicy. A lovely fragrance, identical to the popular perfume. Red-hot cinnamon you can almost taste. Citrus and cinnamon are the lovely top notes of this candle. Clove and vanilla make up the wonderful middle notes to make this a fragrance not only for Christmas! Fragrance identical to the perfume. Just like fresh cooked, tart cranberries. Cranberries along with marjoram, ginger, basil and a little pine make this a very popular fragrance. True to the flower, a strong beautiful fragrance. Juicy fragrance of fresh Georgia Peaches. An amazing blend of citrus, spices, grassy notes, jasmine, and lavender. Exciting and exotic fragrance. A bold and crisp reminder of a summer honeysuckle. Sweet apple combined with clove and cinnamon create this mouth-watering fragrance. True lavender fragrance, relaxing and soothing. Extremely refreshing and invigorating splash of cool lemon. This candle will remind you of spring and fresh lilacs in bloom. An identical smell of the delicate spring flower. The citrus fragrance of mandarin, mellowed by the smoothness of sandalwood, makes this combination very appealing. Just like sweet mulberries right off the tree. Spices of cinnamon, and clove are blended with warm, juicy apple to make this home-warming fragrance. Truly the fragrance of warm cider brewing on a cool day. Nag champa fragrance originates from the flower of the champa tree in India. Many people describe nag champa as a light, powdery fragrance. It is a favorite among many. A decadent tropical fragrance of pure passion fruit, guava juice, pineapple and apricot nectar. Creamy butter, vanilla, caramel, and a bit of spice makes this a truly delightful fragrance. A delectable fragrance. Citrus, kumquat, pineapple, and blueberry. A warm earthy scent. Balsam, spruce, and cedar, along with very subtle hints of apple and peach, make this fragrance reminiscent of a fresh pine woodland. A fresh bouquet of plumeria blossoms blooming in the Hawaiian tropics. A lovely flower recognized as the main flower in Hawaiian leis. A delicious mixture of caramel, brown sugar and rich maple drizzled over chestnuts in a sweet, buttery cream base. Southern Peach, a little raspberry and the sweet aroma of the magnolia. This fragrance invokes feelings of a relaxing day at the spa. Fresh marine citrus accords are blended with just a hint of flowers and musk. Sparkling citrus and exotic teakwood shine through in this new and exciting fragrance. Grapefruit & orange notes blend perfectly with hints of earthy woods. A truly interesting blend. Very unique and exciting fragrance. Cascading waterfall of fresh flowers, with deep earthy undertones. Wonderful herbal fragrance, refreshing, romantic, sensual. Identical to the fragrance in the very first Herbal Essence shampoo. Delicious shavings of nutmeg, ginger, allspice and cinnamon leaf. In the heart, sugary dried figs come together with juicy white grapes. This tropical indulgence includes sweet nectar of sun-ripened mango and ripe peach sprinkled with delicious toasted macadamia. Fresh and earthy scent of Spanish oak moss, rich patchouli, and Siberian balsam fir. All wrapped in a sheer veil of white amber and cashmere musk. Dominant top notes of fresh sage intermingle with zesty citrus. Spicy cloves joined with refreshing geranium embrace this herbaceous fragrance. A fresh, crisp scent of grapefruit is delightfully blended with the sweetness of vanilla to create a magnificent mix. A sweet start of ripe plum, peach, and juicy berries are complimented by a soft heart of jasmine, delicate rose and warm ginger. Scented and hand-poured by SpringHouse Candles. Our tea light candles are: highly scented, poured in tin cups, and will burn for 4 - 6 hours depending on fragrance. We are confident that you will find our tea light candles to be the most fragrant tea lights on the market today. One tea light candle from SpringHouse Candles will fragrance a substantial area. We hand-pour our scented tealights with great attention to quality, as we do when pouring all of our scented candles. People just like you choose our scented tealight candles because of the wonderful fragrance that just one tealight will give. Our customers love our tealights. They are amazed that such small scented candles will give off so much fragrance. Our tealight candles will scent an entire room. 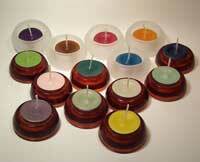 We pour and wick each tealight by hand, one candle at a time, with great attention to quality. We package our tea lights with 6 tea lights per box. Our tea lights are poured in tin cups. Many people ask us why we do not use the clear plastic cup for our tea light candles. The reason we use a tin cup, for our tea lights, is for safety. There have been many recalls, by the Consumer Product and Safety Commission, for tea light candles poured in plastic cups. When tea lights are burned in plastic cups, if the tea light wick does not stay centered while burning, the flame can touch the plastic cup, melting it, or cause the plastic cup to start on fire. Thus, we use tin cups for our tea light candles. Burn a couple of different fragrances of tealights at the same time. You will be amazed at the beautiful fragrance you can create by burning 2 or more candles, of a different fragrance, at the same time. We have a great selection of tealight candle holders and votive candle cups to hold our tealight candles that accentuate the decor of any home.